S Newman, V Gulati, S Bahadori, T Wainwright, R Middleton. Content and Face Validity Assessment of the Sim-K Haptic-Feedback Enhanced Total Knee Replacement Virtual Reality Simulator. The Internet Journal of Orthopedic Surgery. 2019 Volume 27 Number 1. Virtual reality simulators for open orthopaedic procedures, such as total knee replacement (TKR), are uncommon compared to arthroscopic or fluoroscopic procedures. 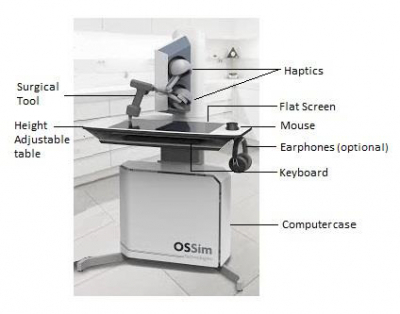 The Ossim Sim-K is to our knowledge the first virtual reality TKR simulator with haptic feedback and we sought to investigate the face and content validity of the first iteration of this device. Thirty members of the local orthopaedic department were recruited for this study. After completing a full simulation, each candidate completed a questionnaire utilising a 7-point Likert scale throughout, to assess face and content validity. Candidates were deemed either inexperienced or experienced based on whether they had performed less or more than 40 TKR respectively. Questionnaire results were positive for all items related to both face and content validity, though inexperienced surgeons were more positive about the Sim-K in 7 of the 10 face validity items and 2 of the 5 content validity items. The Sim-K was well received, particularly by inexperienced surgeons with respect to both face and content validity. The Sim-K represents a promising start in the production of a TKR simulator with haptic feedback. With further development this system has the potential to be valuable in the training of orthopaedic surgeons. Declaration: This work was funded by OSSimTech (Montreal, Canada), developer of the Sim-K TKR Simulator. No authors receive direct funding or have a financial interest in the company. Symptomatic knee osteoarthritis (OA) is a chronic, debilitating, painful condition estimated to affect 4.1 million people in the United Kingdom (UK) 1. Surgical treatment for end stage knee OA most commonly involves removal of the damaged joint and the placement of a total knee replacement (TKR). TKR is the commonest joint replacement procedure performed in the UK and consequently a large number of trained surgeons are required to meet the demands of an aging but increasingly active population. Surgical training has traditionally followed an apprenticeship model, with trainees observing procedures before undertaking operations under supervision before progressing to independent practice. Over the past two decades, surgical training has had to evolve due to changes in healthcare and workforce policy. Working time restrictions in Europe and the United states have reduced the amount of time surgeons spend training in theatre, in the UK this has been estimated at an 80% fall 2. The concept of junior surgeons learning on patients is increasingly unacceptable in modern healthcare systems where patients rightly demand excellence, surgeon outcomes are closely scrutinised and financial efficiencies are sought 3,4. Simulation training has historically been used by the aviation industry to allow trainee pilots to advance their skills in a controlled environment with no risk to passenger safety. There is significant overlap between the worlds of aviation and surgery with both spheres requiring high levels of competence to reduce risk and potential catastrophic consequences 5. Orthopaedic surgical simulation traditionally comprised synthetic bone workshops or cadaveric training; limitations included gaining access to such training, economic cost and restricted opportunities for focussed repetition of procedural steps. Virtual reality simulators such as the OSSIM Sim-K offer a potential solution to some of these challenges, and allow trainees to obtain both psychomotor skills and knowledge required to successfully perform certain operations. Virtual reality simulators for orthopaedic surgery have been available for many years, but have tended to focus on operations that are normally visualised two-dimensionally on a screen, such as arthroscopy or fluoroscopy (x-ray) guided procedures 5. TKR is an open operation and the Sim-K is therefore a departure from previous simulators and differs from the Touchsurgery application (Touchsurgery, London, UK), which takes users through the stages of operations on a touchscreen, through the provision of haptic feedback via simulated surgical instruments. The realism of the experience whilst using the simulator is important and simulators should undergo scientific evaluation in this regard 6. Face and content validity are two important concepts in this regard. Face validity refers to the realism of the experience whilst content validity is a judgement of the teaching ability of the simulator. The purpose of this study was to assess the content and face validity of this prototype simulator. The Sim-K is a stand-alone device stationed on a height adjustable mobile cart. It comprises: a quad-core PC, a high definition flat screen, a generic surgical tool attached to a 5 degree of freedom force feedback device and a 6 degree of freedom motion tracking system, mouse, keyboard and headphones (figure 1). The Sim-K software incorporates a number of practice stages involving drilling and sawing tasks, with visual feedback given after each drilling or sawing motion in the form of a histogram for a variety of metrics (table 1). 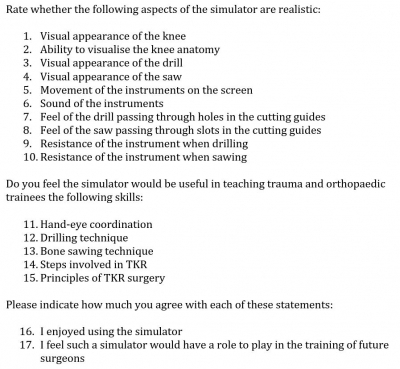 The simulator provides the option for completing either a right or left TKR with 19 stages in each. The generic surgical tool is designed to resemble a standard surgical power tool (figure 2). Movements of the tool are replicated by an image of the tool on the screen. The user may change between a saw or a variety of different diameter drill bits using the mouse and a menu in the corner of the screen. A knee, or other target during the practice stages, is displayed on the screen and may be manipulated into different positions using the mouse. When the image of the surgical tool comes into contact with the knee or other target on the screen, resistance is felt through the surgical tool. During the TKR simulation the order of the steps is defined and is limited to sawing and drilling stages with soft tissue and cutting guide/implant placement stages animated without user interaction. After each sawing or drilling motion the surgical tool is withdrawn a short distance from the target and the simulation moves automatically to the next task. The study was approved by Research Ethics Committee. 30 subjects were recruited from the staff of the local orthopaedic surgery unit. All subjects were qualified medical professionals with varying degrees of experience of knee surgery. The 30 subjects were divided into an experienced group of 15 subjects, defined as those with over 40 TKR as primary surgeon (minimum number for completion of training in the UK) and an inexperienced group with fewer than 40 procedures as primary surgeon. Subjects were shown a video demonstration of how to operate the Sim-K and provided with a written set of instructions to read. Each subject was asked to complete two practice stages, one using drilling guides and one using sawing guides prior to completing either a left or right TKR simulation. After using the simulator, subjects were asked to complete a questionnaire with responses based on a 7-point Likert scale to assess the face and content validity of the simulator (table 2)7. Data was also collected on age, gender, surgical experience and simulator experience. Questions posed to subjects. All responses were on a 7-point Likert scale with 1= Strongly Disagree, 4= Neutral, 7= Strongly Agree. Data was assessed for normality of distribution using histograms and Q-Q plots (SPSS 23, IBM, Armonk, NY, US) and compared using the unpaired Student t-test. Responses to the questionnaire are displayed in table 4. Overall responses were positive (>4) for all items with respect to both face and content validity. When responses for the two groups are considered independently the inexperienced group were more positive, with significantly higher responses in 7 of the 10 face validity items and 2 of the 5 content validity items. Although the experienced group were less positive about the simulator, only one item, relating to the visualisation of knee anatomy, produced a mean score less than 4 (neutral). Overall, this study provides evidence of face and content validity for the Sim-K. 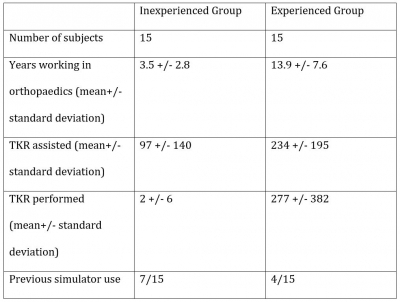 Both groups reported positive feelings with respect to enjoying using the simulator and with respect to its potential as a tool for training surgeons, though the less experienced surgeons enjoyed using the simulator more than the experienced surgeons. Questionnaire results. All items use a 7-point Likert scale 1= strongly disagree, 4=neutral, 7= strongly agree. 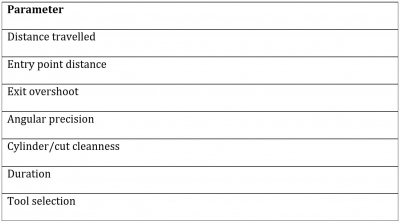 Items 1-10 relate to face validity, items 11-15 to content validity. Items 16 and 17 relate to enjoyment with using the simulator and its potential use in training respectively. The items are listed in table 2. Virtual reality simulators offer an interactive and safe means to acquire new surgical skills and knowledge. In the context of decreased surgical training time they are a valuable training tool, especially given increasing scrutiny of patient safety and operative outcomes. Orthopaedic virtual reality simulators have principally concentrated on arthroscopic or fluoroscopic procedures 5. 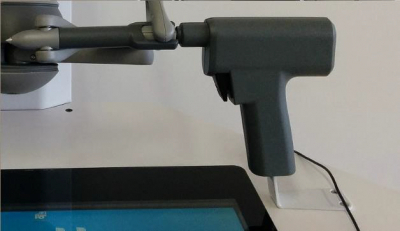 Open procedures, such as TKR or total hip replacement are more difficult to replicate, the Sim-K therefore is an innovative approach to this problem by combining a two dimensional image with an instrument providing haptic feedback. The results of this study provide encouragement with respect to the success of the simulator in replicating the experience of performing a TKR, with positive responses attained from items related to both face and content validity. High fidelity simulation of a surgical environment is challenging and the lower scores posted by the experienced surgeons suggest there is room for enhancing the experience further. In considering educational theory applied to the use of simulators in the training of a surgical skill, two concepts stand out: Ericsson developed the idea of deliberate practice, whereby a skill is gained through focussed repetitive practice with detailed feedback on performance 8. The second theory is that of the three stages of motor acquisition as described by Fitts and Posner whereby learners progress through cognition, integration and automation stages 9. In the cognition stage learners understand the skill through explanation and demonstration, during the integration stage the learner is able to fluidly perform the task and improve their performance through deliberate practice with feedback and finally in the automation stage the learner refines the skill and is able to adapt to different scenarios. The process of repeated practice with simulators has shown positive results in other surgical procedures 10–13. Though our study did not directly assess repeated use, the Sim-K was enjoyable to use, with inexperienced surgeons rating it particularly highly, suggesting users may be amenable to repeated use and learning through deliberate practice. The Sim-K offers greater potential for deliberate practice than alternative methods of learning TKR such as through operating on patients or even synthetic bone workshops both of which are limited by availability for trainees 5. With respect to limitations of this study, the sample size of 30 is relatively small and the inclusion of only male subjects is a potential source of bias, however comparable studies have used similar or smaller size samples 5 and the gender distribution was not by design, but is reflective of the staffing within the local orthopaedic department. In conclusion, this study provides evidence of face and content validity of the Sim-K TKR simulator. The current iteration of the device is a promising start in the development of this simulator as an educational tool. Further development and testing is required to demonstrate that the simulator can differentiate between experienced and inexperienced surgeons (construct validity) and that skills acquired are taken into clinical practice (transfer validity). 1. Arthritis Research UK. http://www.arthritisresearchuk.org/arthritis-information/data-and-statistics/data-by-condition/osteoarthritis.aspx (accessed 16 Jan 2017). 2. Morrow G, Burford B, Carter M, Illing J. The impact of the Working Time Regulations on medical education and training : Literature review. Report for the General Medical Council. 2012http://dro.dur.ac.uk/10904/1/10904.pdf. 3. Bridges M, Diamond DL. The financial impact of teaching surgical residents in the operating room. Am J Surg 1999, 177: 28–32. 4. Consultant-level outcomes data for orthopaedic surgeons launched. Natl. Jt. Regist. 2013.http://www.njrcentre.org.uk/njrcentre/NewsandEvents/Consultantleveloutcomesdata/tabid/323/Default.aspx (accessed 16 Jan2017). 5. Tay C, Khajuria A, Gupte C. Simulation training: A systematic review of simulation in arthroscopy and proposal of a new competency-based training framework. Int. J. Surg. 2014, 12: 626–633. 6. McDougall E. Validation of surgical simulators. J Endourol 2007; 21: 244–7. 7. Gavazzi A, Bahsoun AN, Haute W Van, Ahmed K, Elhage O, Jaye P et al. Face, content and construct validity of a virtual reality simulator for robotic surgery (SEP Robot). Ann R Coll Surg Engl 2011, 93: 152–156. 8. Ericsson KAK, Krampe RRT, Tesch-Romer C, Ashworth C, Carey G, Grassia J et al. The Role of Deliberate Practice in the Acquisition of Expert Performance. Psychol Rev 1993, 100: 363–406. 9. Fitts P, Posner M. Human Performance. Brooks/Cole: Belmont, CA, 1967. 10. Gallagher AG, McClure N, McGuigan J, Crothers I, Browning J. Virtual reality training in laparoscopic surgery: a preliminary assessment of minimally invasive surgical trainer virtual reality (MIST VR). Endoscopy 1999, 31: 310–3. 11. Seymour NE, Gallagher AG, Roman SA, O’Brien MK, Bansal VK, Andersen DK et al. Virtual reality training improves operating room performance: results of a randomized, double-blinded study. Ann Surg 2002, 236: 458-63–4. 12. Munz Y, Kumar BD, Moorthy K, Bann S, Darzi A. Laparoscopic virtual reality and box trainers: is one superior to the other? Surg Endosc 2004, 18: 485–94. 13. Hyltander A, Liljegren E, Rhodin PH, Lönroth H. The transfer of basic skills learned in a laparoscopic simulator to the operating room. Surg Endosc 2002, 16: 1324–8.